It was in July of 2012 that I suddenly realized that we had won, at least scientifically. It was now clear that we had a consistent set of scientific ideas that supported the importance of insulin signaling in basic biochemistry and cell biology and that there was a continuum with the role of dietary carbohydrate restriction in obesity, diabetes or for general health. The practical considerations, how much to eat of this, how much to eat of that, were still problematical but now we had the kernel of a scientific principle. In fact, it was not so much that we had the answer as that we had the right question. In science, the question is frequently more important than the answer. Of course, winning wasn’t the original idea. When my colleagues and I got into this, about ten years ago, coming from basic biochemistry, we hadn’t anticipated that it would be such a battle, that there would be so much resistance to what we thought was normal scientific practice. Surprisingly, it was cancer studies that showed us how it all fit together. The locale was the conference in Washington, D.C. called “Metabolism, Diet and Disease.” The first day of the conference would probably be more accurately described as Metabolism, Drugs and Cancers. A surprising thread in the various talks — surprising to me — was the interaction between obesity and cancer. Less surprising, because of the numerous studies, was the effect of calorie restriction, the apparent basis for the connection between obesity and cancer: reducing calories has been shown to reliably increase longevity and to control cancer in animals. An additional thread was that the hormone insulin popped up as a major player in various experiments in cancer. The identification of downstream signaling elements — the compounds and proteins that transmit the information about cell stimulation to the interior of the cell — were important results and, again, they frequently pointed to the components of insulin pathways and even to an association between cancer and diabetes. This was not new to me — outstanding experiments had pointed the way to the critical role for insulin and I always wondered why the connection to dietary carbohydrate was not made. In any case, the second day of the conference included presentations on dietary carbohydrate restriction. Although not listed on the organizing committee, Gary Taubes had been one of the organizers and deserves credit for a program with both cancer people and low-carbohydrate people. My colleague Dr. Eugene Fine presented a poster at the Washington conference. Posters don’t always have a big impact and we are grateful to Gary Taubes for making Gene’s poster known to the main speakers. The work, now published in a journal article, describes a small study conducted with ten seriously ill cancer patients. The study had the modest goal of showing that a ketogenic diet was a safe and feasible regimen and, in fact, the patients did well and six of ten had stable disease or partial remission. By itself, this study would usually been considered only a small step forward, but, in fact, it was a key link in tying together the field of carbohydrate restriction and the field of cell signaling in normal and cancer cells. A study such as this is difficult to do — patients need to have refused or failed chemotherapy; that is, for patients to agree to experimental nutrition approaches, they usually have exhausted the traditional regimens. One way to look at the significance is that, given what we know about insulin and what we know about low carbohydrate diets, the experiment should have been done twenty years ago. There were simply two lines of thought that had to be brought together. Now in hindsight, it seems that workers in carbohydrate restriction should have paid more attention to downstream cell signaling; we thought that the role of insulin in system biochemistry made it clear that carbohydrate restriction was built on a solid foundation. The resistance to the idea seemed incomprehensible and parochial but this conference made it clear that there was more that was needed to make a consistent biological story. It became clear that there was a conceptual barrier to acceptance of carbohydrate restriction beyond the traditional resistance to anything associated with the Atkins diet. There was a mindset that prevented adequate synthesis of all the information. Much of the valuable work on cell biology was informed by an approach to disease that tended to downplay the biochemistry at the upstream-stimulus level, namely, what you eat. The major goal was to characterize the individual components in the inner working of the cell and to search for those components that were specifically malfunctioning in pathological states. These agents, primarily proteins, could then be targeted with drugs, either directly or indirectly, sometimes through their synthesis at the genomic level. With the important observation that calorie restriction could ameliorate or prevent cancer, a link with obesity was established and, in some way, excess calories became interchangeable with weight gain. The obesity-cancer link became a serial link and it was assumed, as it is in nutrition, that preventing obesity was part of preventing associated pathologies. (In this way, successes of carbohydrate restriction in improving cardiovascular risk factors, for example, have frequently been dismissed as due to the attendant weight loss despite evidence that the improvements in risk factors or other outcomes persist even in the absence of weight loss or even when benefits were demonstrated in eucaloric trials). The rationale, then, was that calorie restriction, the recognized approach to obesity, would point to those intracellular components that could be targeted for drug development. In many cases, this was a conceptual error. In nutrition, it is likely that the doctrine of “a calorie is a calorie” is the single greatest impediment to understanding. The identification of obesity with excess calories, and the failure to look beyond this effect, that is, the failure to ask how the separate nutrients, carbohydrate, fat and protein individually affected cellular metabolism and how these effects interacted — there is, after all, no calorie receptor — compromised otherwise sophisticated and informative experiments. Similarly, we and other workers in carbohydrate restriction failed to see how important it was to look at downstream cellular signaling. The Washington conference represented two parallel approaches to the problem that continually brushed up against each other. Gary Taubes and the other organizers made it happen and, if it wasn’t at the level of the Solvay conferences, it may prove to be a landmark. I take credit for standing up during the final panel discussion (at 22:40 of the video) and making my Emperor’s New Clothes speech which explicitly said that both the cell biology of cancer and the upstream biochemistry of obesity were all about insulin and insulin was controlled primarily by carbohydrate. It is not really the personal involvement that makes me describe Gene Fine’s feasibility study of low-carbohydrate diets in cancer as having such impact; we, in fact, didn’t see it that way when he started. The study treated ten seriously-ill cancer patients with low-carbohydrate ketogenic diets and showed that it was a safe and feasible regimen for such patients. The rationale followed from the fact that rapidly-growing tumors have an increased requirement for glucose (cannot metabolize fat or ketone bodies well). However, in designing therapy, simply reducing carbohydrates to give the host an advantage was unlikely to be effective since blood glucose is regulated to stay fairly constant and, in addition, the tumors may over-express GLUT1 receptors (the insulin-independent transporter for glucose); that is, tumor cells are good at getting whatever glucose is made available in the bloodstream . Ketosis, however — the state associated with very low-energy or very low-carbohydrate intake — held some promise. Fine’s hypothesis was that if we think of cancer in terms of evolution, we could imagine cancer cells as having evolved through the life of the individual, an individual whose systemic environment, in a modern setting, would be unlikely to have any significant level of ketosis. In other words, there was little selective pressure for adaptation to the use of ketone bodies as a fuel source. The host, on the other hand, was well-adapted to this substrate — it is unlikely that our ancestors regularly had “four squares a day.” (We know from biochemistry that normal tissues are well adapted to ketosis). Some fraction of cancer cell lines, then, might be expected to deal poorly with a ketotic environment. Some might actually be inhibited. Although the study had a small n, several of these advanced cancer patients became stable or showed partial remission. It turned out that those who became stable or showed partial remission had the highest level of ketone bodies. The figure below shows that the predictor of this outcome was ketonemia (ketone bodies in the blood). Patients who demonstrated stable disease or partial remission had a three-fold higher average ketotic response compared to those with continued progressive disease. 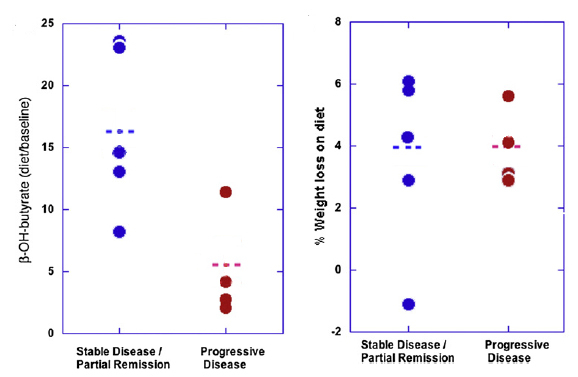 In distinction, both groups had similar calorie deficits or, as shown below, degree of weight loss. The figure below shows individual time points with different symbols for each patient. 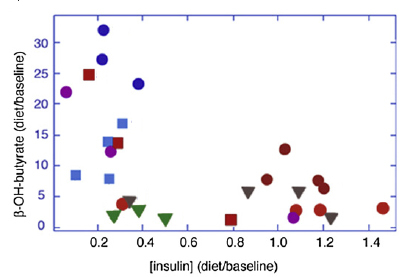 The figure shows, as expected, an inverse correlation between ketone bodies and insulin levels. Ketonemia versus insulinemia: the lowest insulinemia correlated with the highest ketonemia levels. Uniquely colored symbols represent values for each patient. The impact of such a small study was that it could be tied to the vast area of research on the downstream signaling in both cancer and normal cells — that is, the changes in the cell following stimulation by an external food or hormones. Of particular interest is the effect of calorie restriction. It was widely understood that dietary calorie restriction would have a therapeutic effect on animals with cancer and, in addition, reducing calories was the only way to prolong life in animals. Studies following this idea showed that it was an insulin pathway that was involved. Gene’s study nailed the link for us. It is an encouraging situation, because if this is the worst of times in nutrition, it is also the golden age of biology. Being in a position to bring all of the science to bear on what kind of dietary recommendations you can make is heady indeed. In the next post, I will try to present an introduction to the field of cell signaling. I will discuss a cancer study . The starting point for the study is the observation that caloric restriction is capable of causing a decrease in the growth rate of some cancers. The experimental model will be a collection of mice with human tumors implanted, so-called exo-grafts. It turned out that some of these tumors were sensitive to dietary restriction while some were not. What’s the difference? Could insulin be involved? This is fantastic, worthy of “the other” RF. I have one question; where in the Fine trial paper does it specify the cancer diagnosis or type? Are these all brain tumours, or is there a mixture, and if so did cancer type have any influence on the ketone-related response? I love the analysis and integration of the “three realms”, of intracellular protein pathways, serum hormone regulation, and diet. Wouldn’t it be something if it turned out that the success of chemotherapy was largely due to it’s side-effect of appetite supression. If you mean because of the ketosis, ketone bodies do many things. No, Brent primarily means as a result of inadvertent and unintentional carbohydrate restriction, and only secondarily from the induction of ketosis as a result of restriction of ALL nutrients, but most importantly in the case of cancer, specifically carbohydrates, since a defining feature of ALL cancers is that they operate exclusively by glycolysis, the anaerobic fermentation of sugars. The ‘success’ of cytotoxic chemotherapy has an average 5-year survival success rate of just over 2, TWO!! percent for all cancers according to a study published in the journal Clinical Oncology. If you die even one hour or one day after the 5-year period your treatment is considered and logged into the records as ‘successful’. The ‘success’ of chemotherapy is a huge dismal failure that statistically is second only to the failure of statins and their associated NNT (number of patients needed to treat to produce a successful outcome) of 99. I think that there are numerous effects of carbohydrate restriction but simple availability of glucose is not the key component as indicated in the paper and my post. Hate to burst your bubble but this work has already been done, 80 YEARS AGO!! by MD. PhD. 1931 Nobel Laureate & leading 20th century biochemist Otto Warburg, and has and continues to be conclusively proven & re-proven in the years since by many scientists including Dean Burke, former head of the American National Cancer Institute and most lately Thomas Seyfried at Boston College. There is a serious world wide lack of scientific knowledge regarding the biochemistry and physiology of cancer and even just awareness of the existence of Otto Warburg and his Nobel prize winning work in defining the biochemical Prime Cause of ALL cancers: chronic cellular hypoxia from ANY cause that causes a permanent & irreversible switch from oxidative phosphorylation to glycolysis. EVERYONE that has not done so needs to take the time to get grounded in the basic biochemistry of cancer and the history of Otto Warburg and how he conducted the experiments that led to his conclusions and subsequent Nobel Prize for that work, particularly since knowledge of Warburg, his work AND the fact that the prime cause of cancer has been known since at least 1928 continues to be dismissed, disregarded and even actively suppressed. Marvelous! Now if things can only get to the point where carbohydrate restriction is used first for cancer treatment, rather than when there’s nothing else left to do. The outcome might be even better, since the patients wouldn’t have already had so much of their health wrung out of them by the chemo, radiation, etc. Although I would emphasize the science, I think from a practical standpoint, the promise may be in prevention of as an adjunct to other therapies. New Zealand has only one soap opera, the long running hospital drama Shortland Street. 3 or 4 years ago there was a storyline that featured a trial of a low-carb diet in cancer patients. The drama centered on a nurse sneaking chocolate bars to the patients. That’s all I remember – that and a low-carb cheesecake, and the patients moaning about the diet. So the idea is out there. I would guess that at the clinical end many doctors think it’s worth a try and some give patients hints. At least it doesn’t involve them prescribing vitamins, herbs, or acupuncture; it’s something that actually fits in their paradigm. As long as they’re not nutritionists, that is. The report by Fine et al is indeed somewhat promising. I’d be more excited if 1) there had been a control group, 2) if the radiologists reading the PET scans had been “blinded” (i.e., unaware of the treatment provided), and 3) if several radiologists read the scans independently of each other. I realize it was just a pilot study, with all the limitations that entails. I can’t wait to see more research along these lines. Hope you get the funding. Yes. A feasibility trial does not usually have a control group and the import is philosophical. The study was impossible to get funded by large agencies, had great difficulties in recruitment but we hope it can move forward. 1. Was this event big enough to get the attention of the ACS, AMA, etc.? If so, how long do you think it will be before there’s a headline: “New study shows low carb diets carcinogenic”. . . “It has long been known that red meat/high fat/inadequate fruits and vegetables/(fill in the blank) — all hallmarks of a low carb diet — are cancer promoting. . .” ? 2. “Fine’s hypothesis was that if we think of cancer in terms of evolution, we could imagine cancer cells as having evolved through the life of the individual, an individual whose systemic environment, in a modern setting, would be unlikely to have any significant level of ketosis. In other words, there was little selective pressure for adaptation to the use of ketone bodies as a fuel source.” Do I read this correctly — that cancer cells might evolve to thrive on high carb because that’s mostly what they’ve been exposed to? What of someone who’s been on a ketogenic diet most of his/her life. Is it possible cancer cells could then evolve within the lifetime of an individual to make use of ketones? Scary thought. 1. I think that if we can make progress it will be at the scientific level, the integration of carbohydrate restriction and cell biology. Next posts I will describe some work that is going in the right direction. The health agencies and the press will pay attention when they want to. I don’t know how to predict what they will do. The red meat scares will still be out there and that end of it can only be done by the public by social media and interaction will elected officials. My suggestion is that the science can now move forwards separate from policy. 2. More to the point, cancer cells may not have lost the ability to use ketone bodies. The lack of selective pressure does not mean that they will necessarily be washed out and, in fact, may have mutated to use them better so you don’t know. In terms of practice, few people think that any dietary intervention will be a monotherapy for cancer but if we understand the basic biochemistry — the impact of Fine’s paper and of the conference was in the area of the science — it can be an adjunct for drugs or even improve prevention. Yes, excellent point. Cancer in hunter gatherer societies can’t at all be excluded. Cancers have been seen by paleontologists in our distant ancestors, and reports from anthropologists describe a lower incidence of cancers in these groups today. But these kinds of data must be recognized as anecdotal. Hunter gatherers, even the few that remain, do not see doctors, and don’t get post-mortem exams with histopathology. I agree completely that cancers that develop and evolve in this kind of environment certainly would not likely respond therapeutically to a low carb diet. Similarly, cancers in developed countries that may arise in people on low carbohydrate diets would not be expected to be responsive to a continued low carb diet. That said, epidemiologic studies conducted over the past decade show an increased risk of cancer due to hyperglycemia, hyperinsulinemia and obesity, or conversely a reduced risk for those with lower insulin signaling. ‘Real’ risk of course can’t be based on epidemiolgic data but must be tied to mechanism before we can say for certain that increased insulin signaling will ’cause’ more cancers (decreased signaling will reduce risk). However, while still in the investigative stages, evidence is accumulating that hyperinsulinemia/hyperglycemia/obesity can indeed lead to increased cancer risk by causing increased inflammation. This is because the chemical mediators of inflammation such as reactive oxygen species and other free radicals are known to destabilize chemical bonds in DNA, thereby causing chromosomal mutations. Mutations in certain genes are now believed to be the principle setting for the initiiation and development of cancers. I don’t believe that cancers will be eradicated by a low carbohydrate diet. There is a normal rate of free radical production within our cells, and there are other environmental causes for DNA mutations (chemical toxins, background radiation, hormones in our foods, etc.). But as I see it reduced insulin signaling by dietary carbohydrate reduction is likely to reduce our risk of a wide variety of cancers. Brilliant, thanks so much for sharing and adding your eloquence. Although Dr. Siddartha Mukherjee does mention the unusual nature of cellular respiration that cancer cells generate energy from oxygen and glucose first described by Otto Warburg, i.e., anaerobic glycolysis, there is little doubt that the mode of the at least two mutations necessary to get cancer going is beyond diet. Once cancer manifests, however, there is just as little doubt that it can be best controlled by avoiding carbohydrates. That said, given the five or six or seven grams of glucose consistently present in the blood, it’s hard to imagine cancer starving to death even if no additional glucose is present. Minimize growth, yes; kill, I don’t think so. Remove all glucose from the blood and the host will die before the cancer dies; in fact, almost immediately. Can you comment on the effect of carbohydrate restriction on restoring normal cellular respiration? Dr. Warburg’s belief was that once CR was disrupted it was irreversible, if I am not mistaken. Admittedly, you used the word “controlled” and not “reversed” or “corrected”. As in any intervention, it will probably depend on how long it has persisted but there are many cancers and so many different changes, some of which are structural, that one would not be optimistic. In any case, we are just at the beginning or, as I put, we are just asking the question rather than answering it. I assume this was written by Chauncy Gardner in “Being There” but I certainly agree that we need better groundskeepers but I probably don’t want Lady Feinman to pick them out. LOL. The idea is that we might see new primary cancers in immunosuppressed patients who benefit from ketosis – as we do after chemo or radiation – rather than the return of the original. Except that ketosis isn’t known to damage DNA and suppress immunity, which is the usual mechanism for this phenomenon, so it might happen less often. Cancers can die from restored immune function, or sometimes they die for no accepted reason; some mystery illness of tumours perhaps. Remissions in “untreated” patients happen and are treated as natural events by sceptical oncologists. So I don’t think we need to assume that the cancer will always get through, and that we can only delay it at best. A cancer might adapt to burn ketone bodies, but will it get the same “kick” from them? Mightn’t it be a bit like a body builder forced to switch from testoterone to estrogen? Still alive, but not so strong with a different hormonal stimulus? Do you think insulin is the key regulator? What do you think about glucagon or leptin? I think it is all part of the mix. My main point is that the integration of intracellular effects in cell signaling with phenotype-level effects in carbohydrate restriction is the basis for moving forward. I think that, in many cases, insulin can be primary but I definitely want to avoid the “pin-ball machine” approach — this happens and then this happens, etc. It all happens at once. Insulin and glucagon exist in a feedback loop which is probably more complicated than in the textbooks. Since it has been demonstrated that avoiding intake of carbohydrates* results in improved health status, generally, why do people crave them so? And since Dr. Walford’s CRON-diet-fed animals lived twice as long as their wild brethren, may we not assume that the same can be extrapolated to people, if the human CRON-diet is faithfully adhered to? Granted, living in wire cages would improve health outcomes (probably) but shouldn’t we be directing our best efforts toward pinpointing the source of a somatic signal (or signals) leading people to seek carbohydrates and put a hermetic seal on it? In the meantime, the litter of carbohydrate-rich snacks and drinks could be profitably restricted quite easily if that were a defined outcome. Strangely, the very opposite seems to be the intent, especially around the end of October and the middle of February when candy is king. May we further hypothesize the existence of a signal to maintain blood sugar at abnormally high levels, come what may? If there is such a signal, what is its value to survival? If there is not such a signal, what conditions combine to create the effect of such a signal? The fact that cancer would seem to benefit from such a combination is patently counter-intuitive. If we can defeat the effect of such an hypothesized signal, have we really solved a problem in human metabolism and chemistry or have we only discovered another work-around, the kind of trapdoor that Nature often provides, as it were? Have you read the piece about visceral (brown) fat self-generating heat in people? Perhaps this is support for my hibernation hypothesis. It Is stimulated by cold conditions. “The discovery of the LDL receptor in 1974 provided the missing link in the understanding of fatty acid transport and the potential role various fats could play in human health [cancer].” —Goldstein, J.L. ; Brown, M.S. There are a number of interesting points here. For the moment, I will just post as is and may comment on later. Oh, for a low-carb banana. I also read that article in the Times and then read the research design at Pubmed. The problem, as I see it, is that monkeys are too much like people and in order to stay healthy, they make compromises. For example, they need lots of vitamin C and so eat lots of fruit and the fructose that comes with it. I imagine that the high-fructose diet shortens their lives as it would ours. Dr. Denham Harman estimated that, from the point of view of oxidative stress, we could expect to live about 40 years but can live longer if we tolerate declining health status. The work-arounds that get us to 40 cost us dearly. In a carbohydrate restriction diet experiment that used monkeys as subjects, an investigator would have to limit fruit and I think that any monkey diet that limited fruit would also shorten his life. The fruit contains minerals, vitamins (besides C), various phytochemicals and a good bit of fiber. When McCarrison did his studies, he limited the fruit component because it made such a mess in the lab. However, he used rats, not monkeys, and rats make their own vitamin C by the conversion of (you guessed it) carbohydrates. Of course, you could give the monkeys an ascorbic acid supplement, but ta similar problem crops up again. Conceived as a vitamin, the amount given would be in line with vitamin requirements, say in the range of 40mg to 400mg per day. However, monkey biochemistry sees it as a liver metabolite and goes through ten times that amount all stressed out in a wire cage with mama nowhere in sight. In Walford’s CRON-diet experiments (q.v.) the animal of choice was the lab mouse and they make their own vitamin C too (mostly) and favor cozy cramped spaces where they can hide from predators. His DR mice lived fully twice as long as the controls and were healthier in their old age than their fully-fed companions. I’m not saying that I agree with Walford’s methodology or the validity of extrapolation to people, but the mice on DR did live significantly longer. Perhaps it had something to do with the absence of cats in the lab. If I were designing an experiment using monkeys, I would first invent a locarb banana by crossing it with stevia; that shouldn’t be too difficult and i think I could get some backing from Dr. Feinman’s group. Once I had those on hand, the rest would be easy. I would say that Dr. Feniman and his colleagues are beginning to have an effect if the media is trying to debunk their thesis with flawed science. Please take a moment to write a letter to the Times and remind the editor that it’s folly to put a monkey on a fruit-restricted diet and then express surprise when he expires more or less when the controls do. Heaven is where there is no end to the bananas; maybe it was suicide that did them in. Thank you Mr. Feinman for such a useful post on diet and Cancer and to Alfonzo Luz for calling it to my attention. The September 4, 6:53 p.m. post by Cancerclasses about Warburg’s profound and simple explanation of cancer is required reading for anyone interested in cancer. I control my migraines with a ketogenic diet, if I spent too much time in a deep ketosis, my liver became too good in the generating glucose. Does somebody tried to find the appropriate level of a blood sugar for a cancer prevention? I guess if I get a cancer, I would have to use metformine. I think the question is beyond current state of knowledge and I doubt that there is one appropriate level of anything for all cancers. @Galina L. Since all cancers operate by glycolysis and use sugars to fuel their growth & proliferation it’s in our best interests to keep all carbohydrate intake a low as possible. The fasting, homeostatic blood sugar level of between 70 to 90 milligrams per deciliter that the human body fights to maintain all the time equates to just ONE teaspoon of sugar in the roughly 1000 teaspoons – 5 liters – of blood in the average human. Most current dietitians & nutritionists advise keeping carb intake to no more than 12 teaspoons of ADDED sugars per day, others recommend 12 teaspoons of TOTAL sugars. Remember though that 12 teaspoons of ADDED sugars in addition to all other carb intake in a given day can add up to A LOT of sugar, and places a huge burden on the beta cells of your pancreas to produce insulin to drive all sugars ABOVE the homeostatic 1 teaspoon level out of your bloodstream so we don’t kill ourselves with all the carbs we eat. Here’s a little known and greatly under appreciated fact of human physiology: Only ONE percent of the cells in the human pancreas are used to produce insulin, over 98 percent of the pancreas is devoted to producing enzymes for the digestion of fats and proteins! Just based on the design & function of the pancreas it’s easy to see humans have no business subsisting on a high carbohydrate diet and maintaining an exclusively glucose powered metabolism. And now you know why diabetes, obesity, heart disease & cancer rates are so high and still rising. To monitor your sugar intake remember this simple formula that I call the 1-5-20 Rule, meaning 1 teaspoon of sugar equals around 5 grams by weight and has 20 calories. So 12 teaspoons of sugar times 5 grams per equals 60 grams, which times 4 calories per gram for carbohydrates equals 240 calories. Good luck, good health & may the gods bless your efforts to improve your health & quality of life. Interesting point on the pancreas. Adults weigh a lot more than 60 pounds and 60 grams of carbohydrates is a lot more than 20 calories of carbohydrates. I expect this is just sloppy proofreading. Or does the author mean 1 gram of carbohydrates per pound of weight (despite the criss-cross from metric to Imperial). Great Blog , Richard , Thank you for the time and effort. I follow a keto diet (less than 20 grams carbs, Around 100 grams protein ) and have a close family member who has Epilepsy ( They despite medication can have seizures that do not stop without medical intervention ). They are also now on a Keto diet and doing better ( better all round esp blood lipids , Sugar , Inflammation ). Better with the seizures and interesting much better sleeping patterns. My ( lay person’s ) review of the literature suggests the diet works through many ( and possibly many more unknown ) mechanisms and this is likely to be the case with Ketogenic diets and Cancer. Insulin Signalling will be only one of many. Thomas Seyfried suggests autophagy is a key to combating cancer. Drugs can only target one pathway The diet can target multiple pathways..
Seyfried stresses the point that the diet for cancer treatment must be Very low carb/protein and calorie restricted also involving fasting. It seems to me a different emphasis and focus to Eugene Fine ? It looks like you didn’t anderstand my question.I don’t eat sugar except for very rare occasions, my carbohydrates intake is low enough to be in ketosis or close to it most of the time, my migraines are manifestation of epilepsy-like activity in my brain. Because of my diet, I am well familiar with the phenomenon of physiological insulin resistance, especially if I exercise in a fasted state early in the morning, then my FBS could be even something like 120 milligrams per deciliter. I am not a person with diabetes. If I on purpose consume more carbs for a while , my FBS going down, but I feel better when I am in ketosis. So, I am wondering about how concern I should be about BS level which is caused by a diet too low in carbs. I am consulting experts on this. I am quite interested to read the answer to this question. The blanket statement that ‘all cancers use sugar’ bothers me. Dr Myers has noted that his prostate cancer patients do worse on a low carb diet. My great-grand father, grand-father and father all had prostate cancer. I’m 56 with BPH so this lowcarb business puts me in a quandary; Do I live on fatty meats or broccoli? I think that statement is an opinion and, as in the previous comment, I think it is hard to justify any statement that begins “all cancers” but I would be glad to see the evidence. The starting point for Gene’s study, however, does go back to Warburg’s original observation that rapidly growing cancers require glucose but I don’t think one can generalize to all. The foods a cancer can survive on may be much less important than the effects those foods have on growth and other survival factors. If a cancer can survive on ketone bodies, but that fuel does not activate genes that promote growth or proliferation or angiogenesis, genes that may be dependent on sugars for activation, then you would have in effect a benign rather than malignant tumour, and one that could be potentially defeated by the immune system. I question whether a doctor who thinks patients do worse on low-carb actually has low-carb patients. Wouldn’t he be advising against it? And, if he thinks omega-6 is the problem, why he doesn’t just limit this, get them eating more salmon and coconut oil. A lot of things get called low-carb that are just higher-fat or protein, but not low-carb. Some time back, an older friend of mine with rising PSA numbers began adding cottage cheese (quark) and flax oil to his diet in accord with Dr. Budwig’s clinical research and recommendations. On his next evaluation, the numbers had fallen back into “normal” range and his M.D. cancelled the biopsy. Since then, he reports that his M.D. has ignored his prostate gland. My friend will talk to anyone who’s interested. He’s also taking hyaluronic acid and says that between the quark and the HA he’s much happier with what he sees in the mirror every morning. I wouldn’t call this science. Dr. Gerson’s dietary regimen at first excluded all fats but when he saw Budwig’s results, he reconsidered. His daughter, Charlotte, very ancient now, will respond to inquiries about her father’s work and his book is available online somewhere. Does anyone happen to know how one contracts smallpox? My neighbor, the old professor, said something about blankets, but that sounds like a rural legend to me. The legend comes from the idea that the Army sold small-pox-infested blankets to Indians, that is, native-Americans. The idea existed but I think it is controversial as to whether it was actually part of America’s final solution to the Indian problem or not. Smallpox is highly contagious. In most cases, people get smallpox by inhaling droplets of saliva, which are full of virus, during face-to-face contact with an infected person. When someone becomes infected, they do not immediately feel sick or shed virus to their household contacts. In addition, they have no symptoms for 10 to 12 days. After the virus has multiplied and spread throughout the body, a rash and fever develop. This is the “illness” portion of the disease, and it’s when someone is most infectious. Some risk of transmission lasts, however, until all scabs have fallen off. Contaminated clothing or bed linens also can spread the virus. Those caring for people with smallpox need to use special safety measures to ensure that all bedding and clothing from the infected person are cleaned appropriately with bleach and hot water. Caretakers can use disinfectants such as bleach and ammonia to clean contaminated surfaces. Regarding cancerclasses’ quotation of Brian Peskin’s step 4. “An adult weighing 60 lbs….” My nine-year-old grandson weighs almost 90 lbs, so I’m sure there’s a better number available here. This is why I emphasize the need to thoroughly & thoughtfully study Warburg’s work and to achieve a deep level of comprehension about the physiology & biochemistry of cancer. With obesity, diabetes, heart disease & cancer rates at 50 percent and 1 in 3 and 1 in 4 lifetime contraction risk for those diseases people are scared, stressed out and are looking for practical & effective actions they can apply immediately to prevent falling victim to metabolic syndrome (MET-S) related diseases. Problem with that is that most people can’t be bothered to click on a link to research & read up on things themselves and think with their own brain, they want to be told what to do & be led by the hand into health, they want the benefits of good health that come from studying what it takes to be healthy in today’s world, but without spending the time it takes to acquire even the smallest bit of knowledge. Go back and read that whole article at least just one time, if you don’t you will be cheating yourself out of the benefit of all the accumulated knowledge & experience of hundreds of people that have been studying and thinking about these things for the last 100 years. I’m female, but my husband is concerned about prostate health and prostate cancer risk minimization. I don’t know anything about Dr. Myers but when I went to his longevity forum website, he has an odd quote about green tea and tomatoes and cancer cells in the lab and a misleading inference about the Atkins diet and heart disease. The lycopene studies are a far cry from simply eating tomatoes which he seems to slam Atkins for limiting. Ditto for the EGCG studies which are a far cry from simply drinking green tea. ( Atkins by the way advocated both lycopene and egcg supplements.) The notion that the Atkins diet may keep you thin but will cause heart disease at 55 — again this is implied by Dr. Myers’ web site quote — makes me highly susupicious of anything this fellow has to say about diet. Atkins specifically and low carb diets in general do not require anyone to eat fatty meats (not that there’s anything wrong with fatty meats). A meal of poached salmon accompanied by a green salad and side of brussel sprouts and broccoli topped with garlic infused olive oil and washed down with green tea is still low carb. I did a bit more research and see that Dr. Myers implicates arachidonic acid (found largely in animal fats and egg yolks) in prostate cancer. This explains why he does not favor a diet rich in dairy fat or animal meat fats. His web site states that his research demonstrated that arachidonic acid is converted to a hormone 5-HETE which appears to promote the growth and spread of prostate cancer cells. I have no idea if his theories have merit but even if they do, I don’t believe it gives him license to mischaracterize the Atkins type diet as one that could keep a fellow thin but kill him from heart disease at 55. If you believe in Dr. Myers’ arachidonic acid theories and also want to be low carb, then simply follow a low arachidonic acid version of the low carb diet. This also makes sense to me. Thomas Seyfried says there are two fermentable fuels that feed cancer not just Glucose. They are Glucose and Glutamine. “The arachadonic acid results of the new research that Dr. Volek led are just as surprising as what they learned about saturated fat. People on the very low-carb diet showed substantially greater increase in arachidonic acid that scientists have commonly viewed as contributing to inflammation. But at the same time many of the inflammatory markers significantly decreased. What is interesting is that it claims the hyperglycemia of type 1 is not associated with increased cancer risk while that of type 2 is. It also states that lowering glucose in type 2s does not reduce the cancer risk. My understanding is that type 1 is characterized by insufficient insulin while type 2s (especially the overweight type) generally have plenty or even excessive insulin but their cells are resistant to it. Is the exogenous insulin used by type 1s generally less than that generated by type 2s naturally? (Overweight type 2s that I know do not use insulin but rather drugs like Glucophage or Metformin. I thought these drugs increase insulin sensitivity but don’t know if they actually lower insulin levels.) My thin type 2 father controlled with diet alone until the ADA went the way of the food pyramid — then he eventually needed insulin.) Or are the crappy hyperglycemic targets generally aimed for by the ADA resulting in type 1s using less less exogenous insulin and this fact maybe protects in some way from the increased cancer risk hyperglycemic type 2s could potentially face from their naturally higher insulin levels? You raise a number of questions which don’t have easy answers. The Mayo clinic does not seem to recognize a relation between dietary carbohydrate and obesity so it is hard to know what to make of their link. Similarly, the poor level of science in ADA recommendations may have side benefits but it is hard to take much comfort in that. Is cachexia the “last resort” of the body to save it self? I don’t think the body has a mind but it is likely a sign of the there being no last resort “It is a positive risk factor for death, meaning if the patient has cachexia, the chance of death from the underlying condition is increased dramatically” from the Wiki reference. It is often believed, incorrectly, that Warbug’s demonstration that cancer cells have a respiratory defect that causes them to produce lactic acid from glucose, even in the presence of oxygen, should be interpreted as “sugar feeding cancer”. Cancer cells don’t “live on glucose,” since they are highly adapted to survive on protein and fats. Cancer cells use glucose and the amino acid glutamine primarily for synthetic purposes, and then uses fats as their energy source; the growth stimulating effect of the “essential fatty acids” (Suyeyoshi and Nagao, Holley et al.) shows that depriving a tumor of those fats will, in fact retard, their growth. The great energetic inefficiency of the cancer metabolism, which causes it to produce a large amount of heat and to cause systemic stress, failure of immunity and weight loss, is because it synthesizes fat from glucose and amino acids, and then oxidizes the fat as if it were diabetic. Forty years ago, the work of Shapot and Blinov was showing the same effect, except they demonstrated the involvement of the whole organism, especially the liver, in interaction with the tumor. Can we have these references. I have always found Minnesota Wellness to be a reliable resource for the layman. As the stories go, Dr. Warburg became something of a curmudgeon in his old age and sometimes resisted improvements to his Nobel Thesis. His work must be incorporated with that of his students and successors in order to be relevant today. Dr. Budwig was well down that road and had applied his principles successfully in a clinical setting. etitbletsbfree’s observations give us much to consider, especially the role of fats in cancer metabolism. I wonder if he is acquainted with the work of Pierre Jacques Antoine Béchamp whose early work in biochemistry set the stage for Warburg’s later observations. And winter is colder than. . . This has been attributed to Nipsey Russell on wikiquotes which has many other truly dreadful rhymes. It is hazardous to generalize about cancer as if it were a specific disease with reproducible characteristics. In that respect Otto Warburg was wrong. However his insight on persistent dependence on glycolysis is true enough for many cancers, which cannot utilize fat. Some cancers, as you point out, can use glutamine. But to illustrate the problem, most prostate cancers are rather indolent in their behavior and also can metabolize fat as an energy source in addition to glucose and glutamine. On the other hand some very aggressive prostate cancers can not use fat and are dependent on glycolysis. In short, the most important message is that cancer is not a thing; it is many things. That is why it is generally so difficult to treat. Even within a single individual with a primary cancer and metastases, the cancer’s behavior (metabolic characteristics, proliferation rate, use of nutrients, susceptibility to various kinds of inhibitors, drugs, radiation, etc.) can vary from one cell to the next. Metastases are even more likely to differ in their behavior from the primary tumor and from each other. This makes perfect sense, thanks for chiming in. One thing that appears to be coming out of the insulin – cancer connection is, that what substrate a cancer cell can consume is one factor, but what effect that substrate has on hormone levels and gene expression may be even more important; sugar can feed a cancer, but if it stimulates it to grow as well, that’s perhaps more of a problem. As for people who think that feeding the cancer carbohydrate will keep it happy, isn’t that what we do at present? It reminds me of the Churchill quote “An appeaser is one who feeds a crocodile, hoping it will eat him last”. Dr Myers, an oncologist specializing in treatment of prostate cancer, wrote that his patients who adopt a low carb diet do worse when undergoing treatment compared with those who ingest more carbohydrates. Dr Ornish has published results of a vegetarian diet resolving prostate disease. Johns Hopkins recommends a low fat diet for prostate concerns. Prostate cancer may be the odd duck that doesn’t use glucose or glutamate, instead relying on fatty acids for growth? There are likely to be many different ducks depending on where the specific mutation occurs. The new post compares cancers that respond to diet restriction (and probably de facto carbohydrate restriction) and those that don’t. One that doesn’t is prostate cancer. @Alfonso Luz. Granted, cancer is tricky. But I think that if I set out to provide glucose for hungry cancer cells, so they wouldn’t eat up my protein supply, I wouldn’t eat bowls of sugar. I would eat whole carbohydrate foods that wouldn’t further compromise my immune system, and might provide some nourishment for me in the process. I think I might also eat lots of protein to offset somewhat the hostile takeover of the cancer cells, and since over 50% of protein can be converted to glucose, that might also help maintain my own protein supply while entertaining my unwelcome guest. Dr. Fine, thank you for your comments. Many things I didn’t know, or simply had never considered. Marilyn… The only issue with what you are suggesting (the “since over 50% of protein can be converted to glucose” part) is that in the already “stressful environment” provided by the cancer, the last thing I would suspect one would want is to further aggravate the situation by asking the body to create the necessary glucose out of protein (i.e., calling upon increased cortisol, adrenalin, prolactin, estrogen and the likes…). It is one thing to suggest one rely on this survival mechanism to lose weight (which I personally question to begin with…), but quite another to suggest this might be helpful in the presence of cancer and the already quite frequent issues with cachexia… If anything, Hans Selye’s and Constance Martin’s work, among others, have made quite clear the implications of such an approach in healthy people, let alone its effect in cancer patients. I dunno, letitbletsbfree. By “sweets,” I assume you’re talking about plain old sucrose? My hunch is that there would be at least as much stress to the body processing lots of sweets as generating glucose from protein. You assume a lot, in assuming I do indeed mean sucrose (or, at least, solely sucrose) and in assuming that the proper carbs, in the proper ratios (yes, including sucrose, found in many fruits, among other things. but also glucose, fructose, lactose, etc.) would cause any stress. Every one of the organism’s cells’ preference is glucose, so it would be a little odd if it was indeed (in the proper context), as you claim, stressful. Marilyn, I truly fail to see where I might have alluded to such a notion?!?!?? High Fat Hep C diet. I agree completely that carbs may have undesirable effects beyond their own nutritive stimulus effect on cancers, and that these effects are likely mediated by insulin ( I think you said something along these lines in an earlier post). This also has direct bearing on your recent post–ketone bodies, besides being the un-glucose, would also not provide the insulin related anabolic and anti-apoptotic stimuli. These factors were all part of our motivation to aggressively target a very low carbohydrate diet in our pilot study–I.e. it seemed best to recruit as many plausible anti-tumor mechanisms as possible. Thanks for your comments. Research into cancer, at least the research that breaks the media that reaches me, generally gives me the impression that few people involved in cancer research are interested in linking the effect, cancer, with cause. Primarily, it would seem, efforts appear to concentrate upon linking effect, cancer, with commercially lucrative treatments or therapies. I cannot be certain what causes many cancers. However, if in a decade or two a consensus emerged that points to chronic hyperglucosis, chronic oxidative stress, and chronic oxidation of certain lipids (those more reactive of lipids labelled PUFAs) then I would not be surprised, for the high carbohydrate diet, the general reduction of SFAs and MUFAs, willing substitution of SFAs & MUFAs with a surfeit of PUFAs. For any creature, mammals certainly, that gains weight for seasonal advantage and security, like the ‘bear’ or the ‘wildebeest’, that then supplements decline in rations or hibernates it draws down upon energy stored in its own tissues. Body fats, mostly SFAs and MUFAs, are utilised, and perhaps some protein from lean muscles mass. With this arrangement so common in nature, how could SFAs be so toxic to mammalian physiology? I think something has been overlooked. The last four to five decades of the low-fat revolution has distracted true curiosity and objectivity. LCHF diets, as Eugene discusses, have a tendency to impact upon quantity of calories consumed and often they fall, which is discussed as a confounding factor in the small trial. I just finished your book and wrote a positive review of it for Amazon. Many thanks for your efforts to help the lay person understand the subject in a more comprehensive way.